Mike Tyson and Frank Bruno glared across a ring and through the charged Las Vegas air at one another at last. The much-hyped American, the youngest heavyweight champion in history, against a loved but un-fancied Briton bidding to be the first man to bring the world heavyweight title back to his homeland in a century. Their contest had been arranged and cancelled five times, owing to Tyson's contractual issues, a car crash, a divorce and even injuries sustained in a street fight. But when it did happen on 25 February 1989, news channels honed in, boxing edged into public small talk and more than two million people tuned in to BBC Radio 2 in the early hours to see if Bruno could upset a 22-year-old many felt invincible. Some 30 years to the day later, Garry Richardson - who was ringside for the broadcast in Las Vegas - sat down to recount the mayhem with Bruno for a BBC Radio 5 live special. As the infamous Rocky theme tune 'Eye of the Tiger' fell silent, Radio 2's coverage began with Richardson simply stating: "Thank you for joining us for the biggest fight in British boxing history." Bruno, 27 at the time, was A-list and his meeting with Tyson had dragged boxing into the mainstream, with television news bulletins and prime time talk shows devoting time to the colossal challenge he faced. A Bruno appearance from Las Vegas via satellite into the late Terry Wogan's chat show even saw his two young daughters - Rachel and Nicola - brought on camera to surprise him. "The week of the fight you're supposed to be tapering down but we had a lot of press conferences, with Don King promoting and controlling it, it was like he was fighting not me or Mike Tyson," Bruno reflects. "It was highly stressful and very demanding. Every minute you had to do some radio, talk to press, go on TV, do chat shows, it was very draining." Tyson had been out of the ring eight months, while Bruno had not fought in twice as long. Their lengthy lay-offs owed partly to frequent postponements. Tyson had been embroiled in promotional disputes, broken his hand in a street fight, crashed his BMW into a tree and engaged in divorce proceedings with wife Robin Givens. Bruno was patient, insisting he was "kryptonite" in the face of a fighter promoter King was intent on hyping as Superman. King himself went too far, causing controversy in a charged fightweek when he told media Bruno would be returned to Britain "in an incapacitated state". Bruno insisted "dreams do come true", lending hope to the 2,000 Brits paying hefty prices for tickets. But sentiment was lacking from Tyson's end and the man priced at around 1-8 favourite appeared in fight mode for what Bruno recalls was a "pressured" weigh in. "He had a lot of entourage around chatting a lot of rubbish but it's a fight and a war," adds Bruno. "He was looking at me trying to intimidate and I was looking at him the same. "He was a fiercesome, dangerous sort of guy and had an intimidation he put on people. Not me though. But the way the TV built him up in America, I can see the point of view of people saying he had a presence. "I met him when we were younger and spent about three weeks at a gym. We were sparring together. I got to know him from there. I didn't really see him as the knockout specialist or 'baddest man on the planet'. I saw him as a normal human being." And so to fight night, where Bruno would earn around £2m, roughly a third of Tyson's pay packet. Among the 10,000 ringside at the Las Vegas Hilton were Arnold Schwarzenegger, Sylvester Stallone, Muhammad Ali, Sugar Ray Leonard, Sting, Pierce Brosnan, Jon Bon Jovi, Luther Vandross and Whitney Houston, to name just a few. Bruno had spoken openly of how much he missed home during two months in the US. Now, as he walked to the ring, millions turned their radios on at their bedside in his homeland. His manager Terry Lawless simply said he needed "the biggest" shock in boxing history. BBC Radio 2 commentator Ian Darke offered a dose of reality and hope in one swift line: "Of course we don't think Frank can do it but there's always that tantalising little chance that one punch could stun the world." After striding less than 100ft to the ring, Bruno - who had lost his only other world title shot against American Tim Witherspoon - was made to wait by the undefeated champion. "It's nerve wracking but I was hungry, ready for business," he explained to Richardson. "In someone's back yard they will do everything to make you unstable. Send people to your room, keep you waiting, it's all tactics but I had to try and stay calm and get on with it. "If you know the nature of the beast, that is what he tried to do, intimidate people so the fight was won before a punch was thrown. In the ring he walked around me like a wild animal to intimidate but that is what he was all about." And so to the opening bell and Darke's Radio 2 commentary: "A right puts Bruno down in the opening seconds. He's up at two but that's a bad sign. What a terrible start for Bruno." Just 12 seconds had elapsed when Bruno was crashed to the canvas near the ropes. The destruction job many had predicted appeared set to play out. "I just gritted my teeth, had to show some guts and determination and I wanted to hit him harder than I had ever hit anybody," says Bruno. "It was pride, ego, and embarrassment, all fed into one." There was nowhere to hide against the 5ft 10in wrecking ball. Fast forward to the present day and video footage of Tyson training with Kevin Rooney still circulates on social media, showcasing an ability to rapidly shuffle across a ring at pace to cut off space. There was a swarm about his work and Bruno, desperate, held and hit to draw a point deduction. He looked set to succumb until a left hook landed cleanly. Darke's thrilling commentary continued: "What an opening round this is. A left hook from Bruno wobbles Tyson and they give one another a glance at the bell." Bruno recalls: "I did rock him. Only for a little bit. His leg buckled, he dipped a bit. I was trying to follow up. His height being a bit smaller was his advantage as he ducked and weaved to recover for a bit. It was a good moment." Success though was fleeting. A bloodied Bruno was punched illegally after the bell signalled the end of the third, prompting no action from referee Richard Steele. "That was in Tyson's favour fighting in America, having a referee there and whatever," adds Bruno. "If you watch the fight he was doing some tricky business. This is not cricket or badminton, it's different rules. "The corner were saying to put pressure on him. But all the combinations of the fight being postponed, it was all getting to me. "I went in there to make a fight of it and did, so I have nothing to feel ashamed of. He was very ferocious, nasty, vicious and a unique boxer. He was an animal and that's what you have to be to get into the ring." Bruno was under a blanket of pressure and in the fifth round those ringside conveyed the message of doom to those listening back in the UK, with Darke explaining: "Bruno is like a tree about to fall on the ropes. 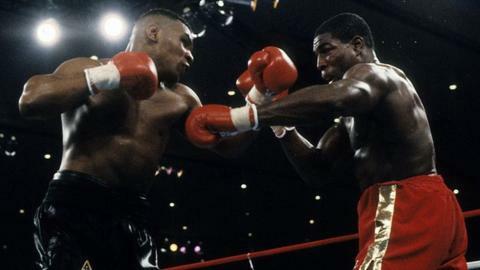 "Mike Tyson has retained the undisputed heavyweight championship on a fifth round stoppage. Britain still does not have a world heavyweight champion this century." Referee Steele concluded Bruno was "courageous" but "a beaten fighter" when the end came. Bruno left the ring commended for his efforts, while Tyson would famously lose his aura of invincibility at the hands of James 'Buster' Douglas 12 months later. "It was unbelievable to be involved in," added Bruno. "I left school, was diagnosed dyslexic, tried to work a normal job on a building site, as a metal polisher, as a shop assistant and went into boxing. It was a gamble. I had a good innings and eventually got my dream of fighting for the world championship." And six years later, he would lift a world title, out-pointing Oliver McCall at Wembley Stadium to reign for six months before losing the belt in his final contest to none other than Tyson. "Sometimes we have a journey, you get kicked down as you get near the top of the hill," adds Bruno. "Hearing the decision when I won was ecstasy. That title, you can't get that in shops, you have to earn it. "Boxing has been good to me and I'm still ducking, diving and making a crust. I'm content."